Alaska's highest value half-day kayaking tour promises a memorable adventure! Meet on the dock in Sitka and prepare for your adventure by suiting up in quality raingear and lifejackets. Climb aboard our fast, custom-built vessel for an exciting sightseeing tour enroute to our floating base camp. Your knowledgeable captain will scan the sea for wildlife and identify points of interest along the way. Upon arrival at our floating base camp, you'll be instructed in the use of safe, oceangoing, two person kayaks by your knowledgeable guide. These stable yet maneuverable craft let you enjoy the beauty of the protected bays and inlets near Sitka from a serene, natural perspective. 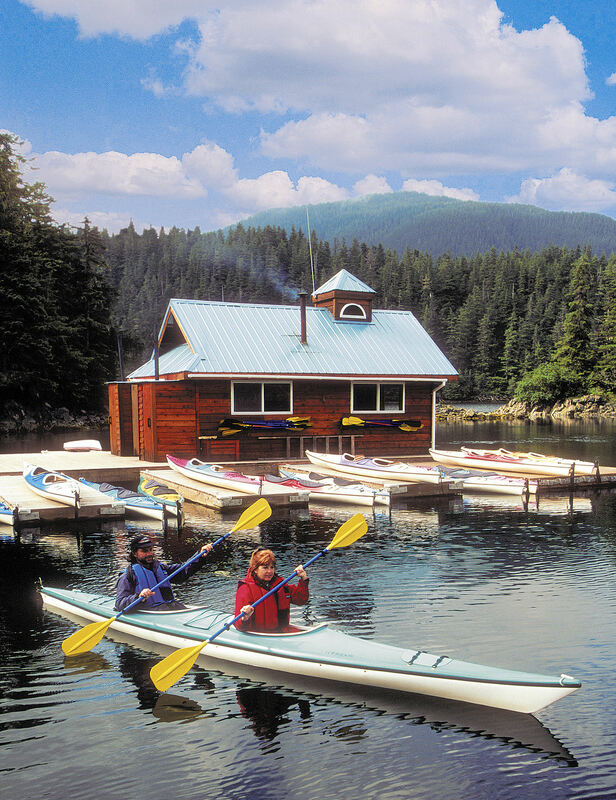 Groups of up to six kayaks will be led by an experienced guide, well versed in paddling techniques and the marine environment of the area. Each of the waterways traveled holds unique attractions in store, be it colorful intertida invertebrates, an eagle swooping from the tree tops, or the grandeur of the lush rain forest. You may even see brown bear, harbor seal, or Sitka black-tailed deer. Suitable for all ages 6 and above however children 12 years old and younger must be accompanied by an adult and weigh at least 40 pounds to fit into required life jackets. No prior experience necessary, just good health and an adventurous spirit. Souvenir T-shirts are available for purchase at the conclusion of the tour. This tour operates in all weather conditions. Some final notes: bring your vouchers and dress comfortably for the weather (if your tour is on the water it will be about 10 degrees cooler.) Camera and binoculars are suggested for land-based tours. However, while on tours involving rafts, canoes and kayaks, we suggest you bring disposable cameras.